Finding quality audio gear at a reasonable price is usually a difficult endeavor. Finding compact audio gear that travels well is also a challenge. To find something that sounds good, doesn’t cost a fortune and travels well – Uber Cool! Such is the iRIg Mic from IK Multimedia. This quality condenser microphone plugs into the iPhone you are already carrying and gives you audio recordings which are bound to surprise you. Made of heavy duty material, this mike feels really good in your hand. With an ala carte menu available, you can get just the effects you need for the recording types you do. The VocaLive app comes with Reverb and Doubler already included (once you register). Singers and songwriters will have a suite of 5 dedicated real-time vocal effects (pitch correction, choir harmonizer, voice doubler, vocal morpher and de-esser) plus 7 effects tailored to vocal processing (reverb, EQ, compressor, delay, envelope filter, chorus, phazer) that can be combined on a 3-processor vocal rig chain. VocaLive also includes dozens of presets to help you get up and running in seconds. Check out the video demo of VocaLive. 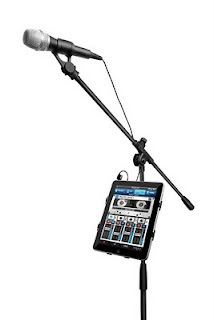 Ever wanted a multi-track recorder? Would you believe a four–track recorder for only $4.99? Believe it. 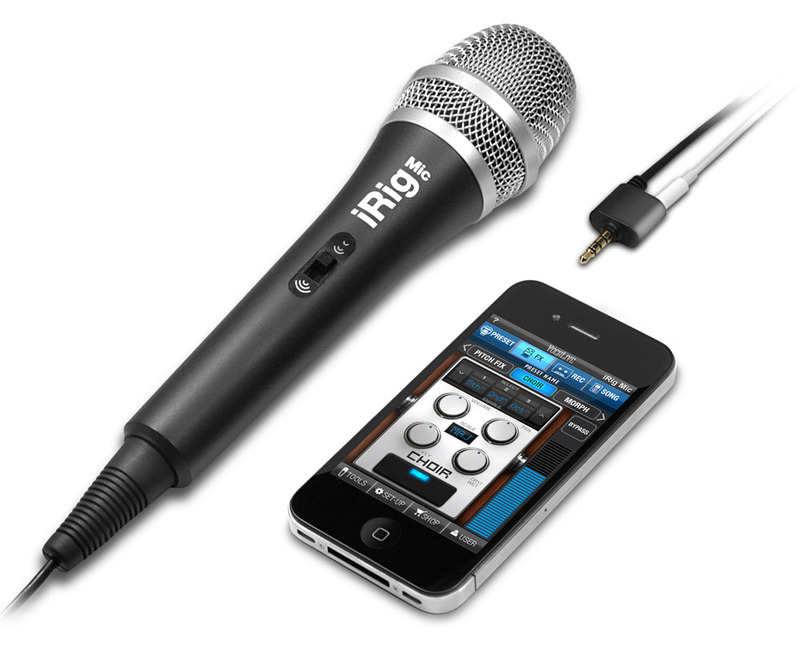 You can even import songs from your iTunes library, drop out the vocal track and rerecord the song with your voice. Way to go IK Multimedia. Both apps will work on iPhone, iTouch and iPad. And if you are using an iPad, you’ll want to check out their iKlip, a sweet, simple adapter that mounts your iPad right onto a mike stand. If you are a performer, you can take your iPad onstage with you. For more details and sample recordings, check out the IK Multimedia website.